via messengers your team already uses and LOVE! Capture up to 35% more leads with beautifully designed chat experience, proven to get you more leads and increase ROI of your marketing campaigns. 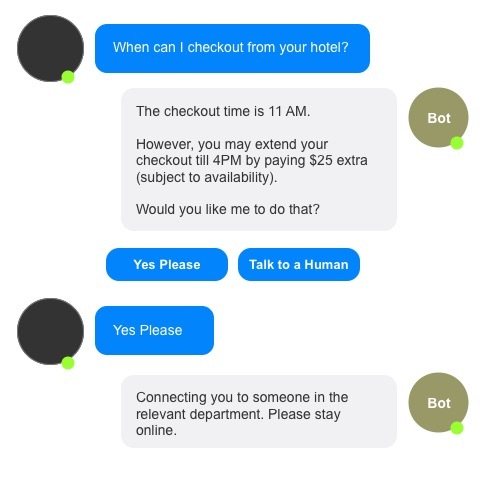 Pre-qualify leads using smart chatbots before that reach human agents. Delightful your customers with prompt and ALWAYS ON Customer support. Smart Chatbots route queries to appropriate departments and Answer queries even when you are asleep. Works with the messengers you already use! It is hard to keep up with all those messengers, and then there is another one for website chat only. Hybrid.Chat eliminates that since it supports the messengers you already use. 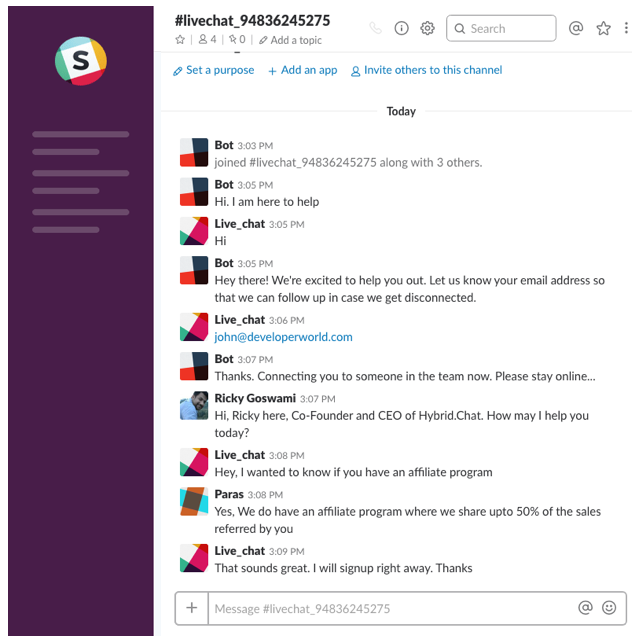 Deploying a Site chat widget / chatbot is as easy as 1-2-3. Building a site chat widget / chatbot is easy. Just copy from pre-built templates or customize your flow by editing a small spreadsheet. If you need help with this part, Connect with us. Next, Connect to your favorite messenger which you already use. Select from a variety of messengers we already support (an ever growing list), and establish connection. Paste the widget code generated in the footer of your website or using Google Tag Manager and you are good to go. If you need help with this part, Connect with us. Chatbots that work as hard as you do! Chatbots that help you capture qualified leads and route chats to appropriate departments quickly. Deploying a chatbot easy and NO CODING SKILLS are required. If you can edit a Spreadsheet, you can build a chatbot. With 20+ in-chat widgets at your disposal, you can build chatbots that capture more leads that a normal site chat solution. See complete chatlogs (whether of humans or bots) to improve the chat flow anytime you wish. Automate the most asked questions / intents and route the appropriate ones to humans. Chatbots come with pre-built NLP that help you build intelligent chatbots that detect intents and route to appropriate chat flows automatically. You can add synonyms or intent variations easily to make the bot sound smarter – All from a simple spreadsheet. Anyone in your team can take up the chat and answer it for you. When a chat session is created, Hybrid.Chat creates a common channels that anyone in your team can access and interact with.